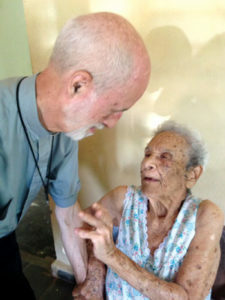 Father Piedra spends time with an elderly friend. A home visit helps sick and lonely people realize they haven’t been forgotten. 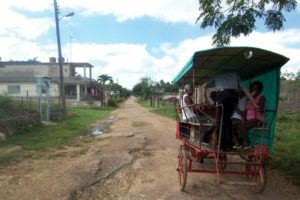 Over the 15 years Father Ruskin Pi­edra, C.Ss.R., has been making regular visits to rural Cuba, he’s seen hunger, the sufferings of sick people whom the government ignores, and steadily declining supplies of food, clothing, and medicine. But he’s also seen great courage, deep faith, and signs of hope. Father Piedra, now 80, is an associate pastor of Our Lady of Perpetual Help Parish in Brooklyn and the founder and director of the Juan Neumann Center, which helps immigrants and asylum seekers with low and no-cost legal services. During his most recent trip, from November 15 through 20, 2013, he was accompanied by his cousin William Piedra, co-missioner Rosario Bergoui-gnan, and immigration lawyer Neil Bernstein. “Life in Cuba is hand-to-mouth, and every year it’s gotten a little worse as the supply of food, clothing, and other essentials has lessened,” he said. “The people beg us to please send them a coat or a blanket. They are so very poor. When people do have the money to buy food, they may not be able to find it. “The scarcity is incredible,” he said, and shoppers might have to go to four different stores to get five items. Visiting sick and bedridden people is a major focus of Father Piedra’s visits. Health care is available for those who live in Cuba’s cities, he said, but people in remote rural areas can wait years for treatment. The rural town of Martí, Cuba, is “absolutely poor and desolate,” with severe shortages of food and material goods. “A professor we visit every year was very highly respected in the government, but once he got sick, they had no use for him. They terminated him, and I wish you could see him now: it would bring tears to your eyes. “I never lived under communism, but I’m beginning to taste the truth of it,” he said. “The state is the important element, not the human being. About four times a year Father Piedra sends supplies such as medication, vitamins, and children’s vitamins. Even the smallest things make a big difference. He tells of being with a friend who was repeatedly wringing her hands, and when he asked what was going on, she said her hands were hurting from arthritis. The parishioners are “very, very simple people,” said Father Piedra, and the core elements of the mission are the rosary, Mass, preaching on the theme of the day, and confessions, as well as a children’s mission. “Very few people come to begin with because of fear. They’ve been educated that there is nothing to believe in, so their faith level is way, way down. Most people have been baptized, he said, “but they don’t know what that means.” Under communism, those who profess their faith could lose their jobs or be blackballed. People feel they need to watch what they say, lest informers be taking note of their comments. Despite these extreme challenges, Father Piedra sees concrete signs of hope. One is the creation of a dining room for the elderly. “Many more are being fed, and many more are being fed better,” he said. Elderly people now have food two or three times a week, with food to take home and make two or three more meals during the week. The boy, Nestor Morales, has now entered the seminary in Havana. “He went to the Dominican Fathers because we weren’t a strong enough presence to get him for the Redemptorists,” Father Piedra said, laughing. As an example, he told the story of an elderly friend, Adriano, who had started the church choir in 1959 and then had to take it underground because they weren’t allowed to practice. On a visit to Adriano, he noticed that the man’s hands trembled, and he thought perhaps his friend had developed Alzheimer’s disease. His daughter quietly told Father Piedra that her father’s hands trembled on account of hunger. “I’m amazed at a man like that, with such beautiful faith, who is still in the Church. You might think he would have given up. No. “It’s people like that who give me hope. Their faith is so strong. So as we missionaries are wont to say, we get more than we give.